It's amazing what you can create using a few pipe cleaners, some construction paper, a few household odds 'n ends and a little imagination. 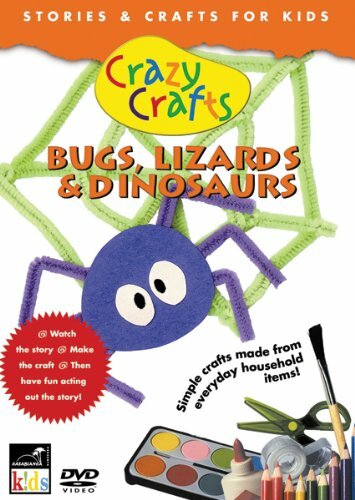 BUGS, LIZARDS & DINOSAURS features Maggie and Jackson making crafts and telling stories about creepy crawlies! Included is the story of Jimbo the Frog, who seeks to show his individuality, a tale about a spider struggling with web-weaving and fun with dinosaurs. Each segment offers a handful of cool crafts that can easily be made by kids with common items. In order to show that he's different from all the other frogs, Jimbo enters every competition in the swamp, with some funny results. Crafts include a jumping frog, a toad, a dragonfly and a mosquito. When a young sipder has problems weaving her web she asks other creatures for advice. A surprising solution solves her problem. Crafts include a spider and silkworm hand puppets, a woven nest, an weaver bird and an owl. When Stegasaurus Doris and Iguanodon Donna see each other in the woods they are convinced they've seen The Meanest, Nastiest Creature in the World. Only Triceratops Pops ease their fears. Crafts include iguanodon, stegosaurus, triceratops and trees.